According to 81 percent of processed data within the CRTA’s election observation sample, the list „Aleksandar Vucic – Zato sto volimo Beograd“ won 44,9 percent of votes. With 19 percent of votes the list lead by Dragan Djilas came second, followed by the list of Aleksandar Sapic with 8,8 percent and coalition SPS-Jedinstvena Srbija with six percent of votes. All remaining electoral contestants did not pass the threshold. Overall voter turnout was 50,8 percent. Election irregularities were recorded at a total of eight percent of polling stations. CRTA election observation mission monitored the overall quality of Belgrade elections. 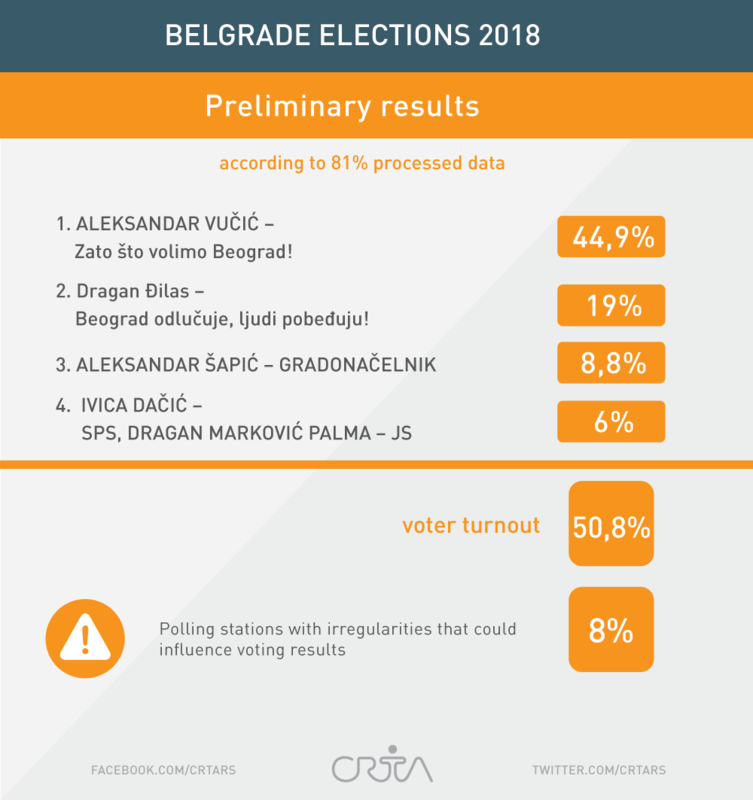 During the Election Day, CRTA observers were deployed at a random and representative sample of 450 polling stations, which allowed the assessment of reporting of the quality of election conduct at the entire Belgrade territory. CRTA election observation mission will present the preliminary report on the Election Day monitoring on Monday, March 5, at 11 am at the CRTA press center (22 Topolska Street).